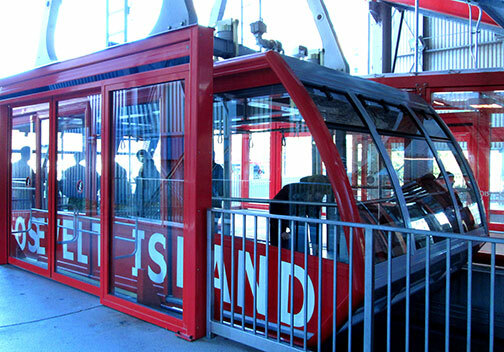 Roosevelt Island: My roundtrip ticket to Istanbul. This past November I bought a roundtrip ticket to Roosevelt Island to meet with Jale, a true Sefardi from Istanbul, and her daughter Olya. 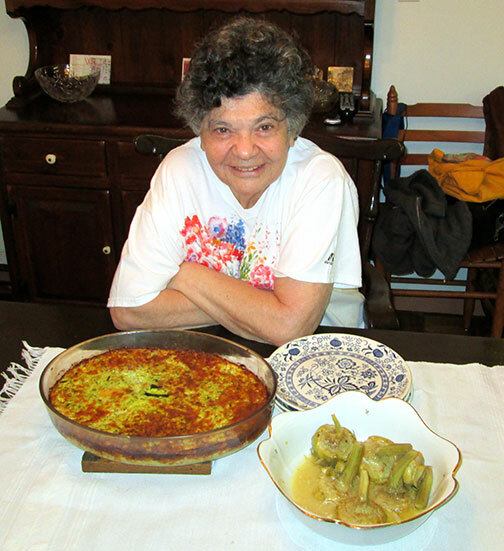 I had already interviewed Jale over the phone that past spring, and on this day we were planning to make a few of her special Passover dishes: Enginara (lemony steamed whole artichokes), and Almodrote (shredded zucchini pie with sheep’s milk cheese and creamy yogurt). I hadn’t been to Roosevelt Island since I was a kid in the 1970s, and I was excited about taking a mini trip away from the city. Boarding the tram felt exotic, and I half expected to be asked for my Manhattan passport. As we flew over the East River and approached land, I imagined that I was on a plane crossing the Black Sea, getting ready to debark on an island near Istanbul. As soon as I arrived, Jale’s daughter Olya welcomed me in and took my coat. Out of the corner of my eye I spotted already shredded zucchini draining in a strainer over a plate, and I smelled something baking in the oven. “Uh oh,” I thought, “I hope that she hasn’t started cooking without me!” (This is a common anxiety I often have when going to someone’s home to learn a recipe.) When Jale came up the stairs and greeted me, she assured me that she had only started some of the simpler things to save time, and there was still plenty of work to be done. “Please sit down for a cup of Turkish coffee and a boureka,” she beckoned. Feeling a bit worn from my travels (after all, I had taken a bus, subway, and tram to get there), I accepted Jale’s hospitality and sat down at the table. The boureka was flakey and buttery, and the coffee was strong, which is just what was needed to prepare for the big cooking day ahead. 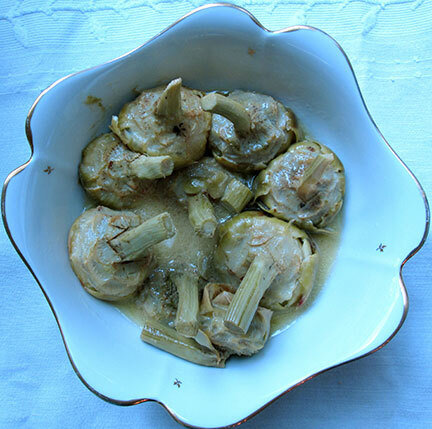 The first dish that we prepared was the steamed whole artichokes with lemon. I must admit that when Jale first suggested that we make this dish together, I didn’t think that it would be something complex enough to learn, but I was very wrong. Without her demonstrating, I never would have understood the proper way to pick a good artichoke (for size and color), how to clean the outside stem, how to cut the top and pluck the leaves, how to scoop out the center to get to the cherished heart, and most of all, how to prevent the outsides from oxidizing and turning black before cooking. We finally got them into a saucepan to steam with freshly squeezed lemon juice, salt, and a bit of sugar to round out the flavor. The results of this “simple” dish were heavenly. The tart flavor of the sauce made by the combination of fresh lemon juice, salt, oil, and a sprinkle of sugar made my Sephardic palate dance with glee. “I’ve traveled to Sefarad,“ I thought. 3. Take a sharp knife and about 1 1/2 to 2 inches up from the base of the artichoke, cut straight across the top so that it resembles a flower with a flat top. 4. Using a teaspoon, scoop out the choke or entire center of the artichoke in order to clean out all of the thin hairs and pointy white leaves (the “flower” should now be like an empty cup inside, with the heart at the bottom). 5. Using a small sharp knife or peeler, clean off the very outermost layer of the stem all around making sure not to make the stem so thin that it bends or breaks off. 6. Take a lemon half from the bowl of water and rub the inside of the shell all over the artichoke to lighten or brighten it. Drop the artichoke in the lemony bath while continuing to work on the remaining artichokes in this same manner. 12 artichokes snugly side by side. 8. Place each artichoke stem-side up into the liquid, then fill with enough cold (about 2to 3 cups) of water to reach halfway up the artichoke base (you should not go as high up as the beginning of the stem). Bring to a second boil over high heat, reduce to medium heat, cover, and cook until arthichokes become very tender and sauce has cooked down to about half, about 30 minutes. Remove cover and cook an additional 15 minutes to cook off more of the excess liquid. 9. Taste sauce and adjust the balance with salt and/or sugar, if necessary. Remove from heat and serve hot, warm, or cold. 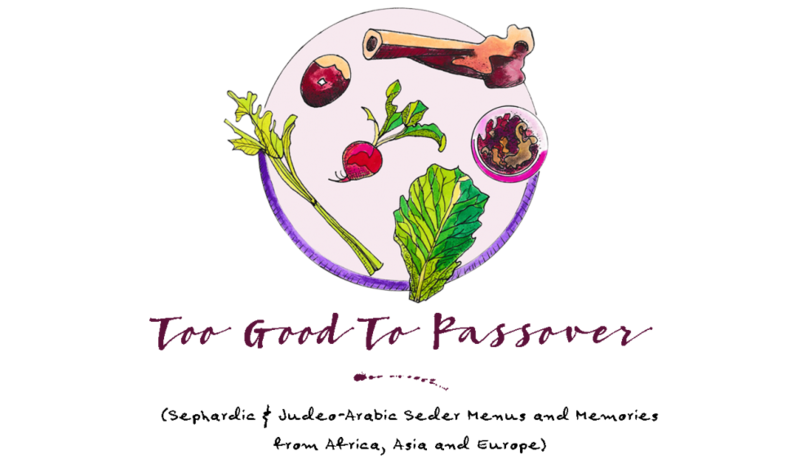 ← Minestra Dayenu: It should have been enough. Nice story and interesting dish.